Now they're safe — and will spend the rest of their lives happy. 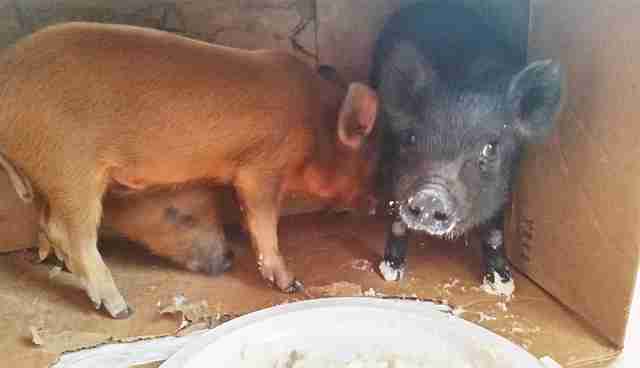 We may not know how long the three baby pigs from a Philadelphia classified ad had spent packed inside a filthy box, left outside under the searing sun. And there's no telling how much worse it could have gotten for them. But Robert Misseri has an idea. "There's no question," Misseri, founder of animal welfare organization Guardians of Rescue, tells The Dodo. "[The pigs] were never going to be someone's pets. No one would have taken them as pets. They would have either been slaughtered or used for some kind of torture, such as dogfighting." Volunteers with Guardians of Rescue, based in New York City, didn't come across these pigs for sale by accident - the organization's investigators are constantly scanning online classifieds sites like Craigslist or forums on Facebook, looking for animals in trouble. Recently, rescuers found three such animals in an online classified ad. 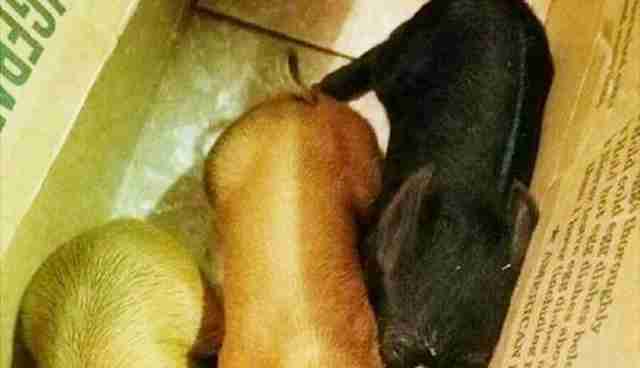 The team then reached out to the seller in Philadelphia and soon learned he had no reservations about who bought the piglets - as long as he got $30 for each of them. Or, at least, $75 for all three. 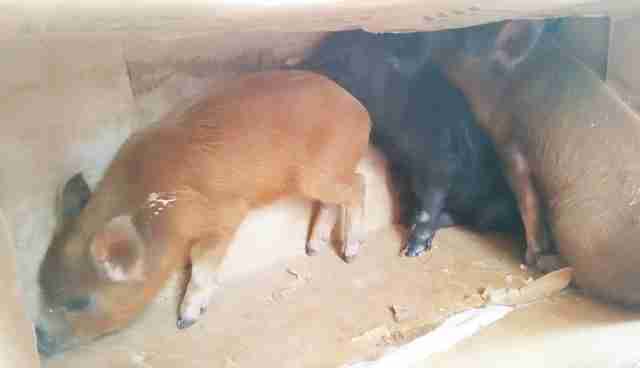 Pretending to be buyers, the investigators from Guardians of Rescue hinted they owned fighting dogs and were looking to use the pigs as as bait. The undercover team suggested the pigs would be used to work up the dogs into a frenzy before a fight. In other words, they would be torn apart. "We were using dogfighting lingo," Misseri explains. "[The seller] had no problem with us using them as bait." 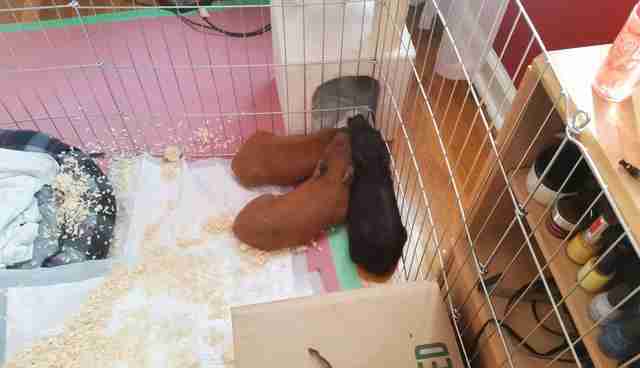 Instead of purchasing the pigs, however, when the group descended on the row house in Philadelphia to meet the seller, they convinced him to surrender the pigs into their care. "We gave him gas money," Misseri notes. For the pigs, it was a ticket to an actual life. They were driven to Ahimsa Acres Sanctuary in New Jersey, a sprawling refuge for ducks, sheep, horses and even another rescued pig named Rocky. Now, these little pigs have the rest of their lives ahead of them. "People don't realize how sensitive and brilliant pigs are," Misseri says. "They were really stressed. It took a day for them to realize they were no longer in jeopardy and in a horrible situation." Of course they won't stay little for long. These pigs, the group later determined, are not the smaller, potbellied variety as described in the online ad. Rather, they will grow up to weigh anywhere from 300 to 700 pounds. But at Ahimsa Acres Sanctuary, they can grow as big as they like. Outside of the box. And for free. "They can be as piggish as they want," Misseri says. "And we'll never hold it against them." While these pigs found their way from an overheated box to rolling acres of freedom, countless more animals are being bought and sold online - most without a happy ending. Online classifieds like Kijiji and Craigslist are no friends to animals. If you're looking to give a home to an animal who truly needs one, visit Adopt-a-Pet.com. And if you see animal cruelty on the internet, here's what you can do.